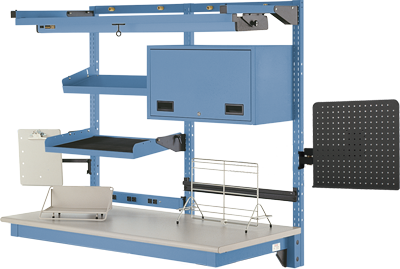 IAC Industries’ MTS upper structure for stand alone workbenches enables users to configure above-the-worksurface storage and accessories into an organized, task-oriented working environment that will adjust up and down with the worksurface to which it is attached. MTS Systems are excellent for upgrading your existing benches on a budget. Fig. 1 (above) - Frame-mounted MTS mounts to any thickness of worksurface with 2.5″ rear overhang on 30″ deep benches and 4.5″ rear overhang on 36″ benches. Fig. 2 (above) - Worksurface-mounted MTS mounts to 1.25″ and 1.75″ worksurfaces with 1.5″ rear overhang. 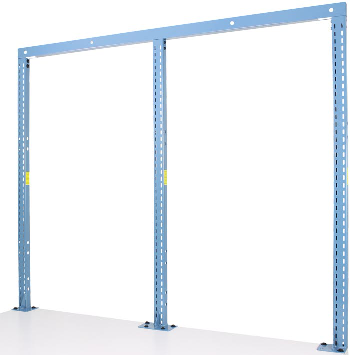 For an upper structure that allows full length shelving, please see our MTS II. Standard Lengths: 60", 72", 96"